This magnificent Indian elephant will bring an exotic touch to your event and thrill your guests at the same time! These elephants will create a captivating ambiance at your tables when they are lit up, sparkling with opulent gold and clear rhinestones and offering good luck too. Also perfect for decor at cocktail hour and adorning religious ceremony areas. The elephant is made from a solid block of poly resin in a rich gold hand painted finish. The elephant is adorned with a detailed carpet on his back and a headpiece in an east Asian design. Clear rhinestone accents on the side complete the look. The elephants hold a round white tealight candle which is included. The lifted trunk is sure to brings loads of good luck to your event and to your guest's homes when they take them as a favor and memento of your special day. Do regular tealight candles fit in the candle slot? Around 1.5' diameter. Yes, reg tealight candle's fit. Just wondering do you have an option to print custom text on the tags or stickers on this candle holder? I have 200 of them in cart. Hi, please could you confirm if there are two Gold Good Luck Indian Elephant Candle Holder. The Gold Good Luck Indian Elephant Candle Holder is individually sold so you will only receive 1 favor in a gold box wrapped and tied with a white satin ribbon. Hi,can I get pair of them packed together. Looking for 50-60 sets. Please let me know Asap. Appreciate your response.Thanks. I'm sorry, they are individually packaged in the production stage. Hi Meera,Wedding Favors Unlimited ships only within the 48 contiguous United States at this time. We apologize for any inconvenience. I am looking to buy the Gold Good Luck Indian Elephant Candle holder is it a set of two? The Gold Good Luck Indian Elephant Candle Holder is sold individually. The picture is just showing 2 views. 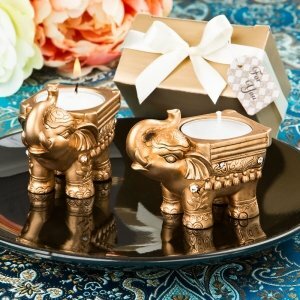 Does each box contain two Gold Good Luck Indian Elephant Candle holder for Indian Weddings? Does the box of the Good Luck Indian Elephant Candle Holder come with one or 2 favors? The Gold Good Luck Indian Elephant Candle Holder is sold individually, so you will only receive 1 favor in a gold box wrapped and tied with a white satin ribbon. Hi want to know the size of elephant candle holder. The size of the Gold Good Luck Indian Elephant Candle Holder is 3 3/4" wide x 1 3/4" tall.